Dr. Nayem Hassan is Chemical Ecologist (pheromone entomologist), currently working as Head, Research and Development, Russell IPM Ltd. Nayem has been involved with Bio-rational crop protection for over 15 years and has specialised in isolation, identification, formulation, bioassay, field testing and evaluation of insect pheromone for monitoring and control of insect pest. He has carried out PhD research work at the Natural Resources Institute of the University of Greenwich, UK between March 2003 and June 2007. Nayem has started work with Russell IPM since September 2007 as a senior scientific officer. 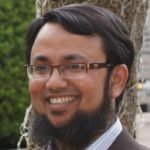 To date he supervises a dynamic research and development team in Russell IPM Ltd. Dr Hassan is an accomplished entomologist with a wide range of experience in both field and laboratory and good knowledge of both the academic and commercial world in the UK and other countries. Nayem has extensive short-term overseas biological control research experience in Asia, Africa and Africa. Nayem is a member of the International Society of Chemical Ecology (ISCE), International Organization for Biological Control (IOBC). He participates in many professional conference organised by International Organization for Biological Control (IOBC), International Biocontrol Manufacturers' Association (IBMA). Dr Nayem is also supervising associates working on and Russell IPM liked Knowledge Transfer Partnerships (KTP) to develop developing smart trap.